NEW BEDFORD, Mass. 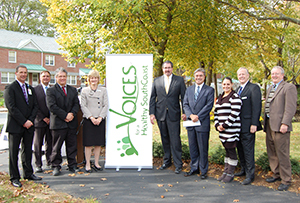 — Voices for a Healthy SouthCoast, lead by YMCA Southcoast and Southcoast™ Health System, today announced that it was awarded a grant of more than $1 million to implement the SouthCoast Healthy Housing and Workplace Initiative (SCHHWI) in Fall River, New Bedford and Wareham. The grant is a part of the U.S. Department of Health and Human Services’ (HHS) Community Transformation Grants (CTG) to support public health efforts to reduce chronic diseases, promote healthier lifestyles, reduce health disparities and control health care spending in small communities. Through the grant, the SouthCoast Healthy Housing and Workplace Initiative will tackle some of the biggest health challenges in this region — heart and lung disease, along with other smoking-related illnesses. The grant will allow SCWHHI to build community leadership and work with housing authorities, landlords and employers to eliminate tobacco exposure in multi-unit housing — especially public housing — and on the campuses of mental health and addiction treatment facilities as well as other workplace campuses. This project will focus on reducing regional health disparities by targeting health problems that disproportionately affect low-income residents and by creating a pipeline of community health workers to focus on populations with the greatest disease burden. Fall River has the highest smoking rate in the state. Both New Bedford and Fall River residents smoke at a rate that is 70 percent higher than the statewide average. Wareham residents also smoke at a higher rate than the state average. Related to high levels of tobacco exposure, the region also has the highest rates of death from heart disease and lung cancer. Fall River and New Bedford residents die from heart disease at a rate 20 percent higher than the state average. Rates of smoking and related lung and heart disease are highest among low-income residents and among people with mental health and substance abuse problems, many of whom are unemployed. All of these groups will be engaged by this project. There is no safe level of exposure to secondhand smoke. It will take the entire community working together to protect the most vulnerable residents, and change the culture — to make good health more appealing than smoking. By focusing on where people live, work, learn and play, the CTG program is expected to improve the health of more than four out of 10 U.S. citizens — about 130 million Americans. Overall, HHS awarded approximately $70 million in prevention grants to 40 awardees focused on improving the health of small communities across the nation. Administered by the U.S. Centers for Disease Control and Prevention (CDC), the CTG Program is a comprehensive prevention and wellness initiative launched in 2011 and funded through the Affordable Care Act’s Prevention and Public Health Fund. These new funds will support areas with fewer than 500,000 people in neighborhoods, school districts, villages, towns, cities, and counties. Awardees represent organizations committed to improving health from a multitude of sectors. Support from the business community, school districts, community-based organizations, and other non-traditional partners is critical to reducing deaths and health costs due to heart attacks, strokes, cancer, diabetes and other serious health problems. Awardees will conduct activities in one or more areas that contribute to the overall goals of the CTG program and help achieve positive changes in one or more of the following outcome measures: weight, proper nutrition, physical activity, tobacco use and social and emotional well-being. The Community Transformation Grants are one piece of a broader effort by the Obama Administration to address the health and wellbeing of U.S. communities through initiatives such as the President’s Childhood Obesity Task Force, the First Lady’s Let’s Move! campaign, the National Prevention Strategy, the National Quality Strategy, and HHS’ Million Hearts™ initiative. The Prevention and Public Health Fund, as part of the Affordable Care Act, is supporting the CTG program and other initiatives designed to expand and sustain the necessary capacity to prevent chronic diseases, detect them early, manage conditions before they become severe and provide states and communities the resources they need to promote healthy living. To learn more about the Community Transformation Grant Program, including a list of all awardees, visit www.cdc.gov/communitytransformation. In March 2009 the South Coast region of Massachusetts was selected to be an ACHIEVE community. The main objective of ACHIEVE (Action Communities for Health, Innovation and EnVironmental changE) is to unite local leaders through CHARTs (Community Health Action Response Teams). Each CHART aims to build healthy communities by specifically focusing on issues such as, physical activity, nutrition, tobacco cessation, obesity, diabetes and cardiovascular disease. Voices for a Healthy SouthCoast (Voices) is the name of the CHART in the SouthCoast region of Massachusetts. The Voices CHART is made up of local leaders including elected officials, state and local directors of public health organizations, business leaders and leaders of local community organizations like schools, recreation departments and hospitals. The goal of Voices is to implement strategies that support and sustain healthy lifestyles where people live, work, learn and play. For more information, visit http://voicesforahealthysouthcoast.org/. ← Bay Village First to go Solar, Makes History Again!